select one This is my first time to bike commute. I bike to work once or twice a week, on average. I bike to work more than twice a week, on average in good weather. I bike to work most days. select one I bike to work year round. I bike to work in good weather. We welcome any questions or comments you have. I helped kickstart the Kickapoo Rail Trail! We have loved giving out Bike to Work Day / Bike Month t-shirts for the last five years. But this year there is a twist, becasue the CU-Bike Month 2015 planning teams was convinced we could leverage all the energy and excitement of our nearly 2,000 participants in Bike Month to together make a HUGE impact for biking in our community. And the way we can best do that in 2015 is to help raise funds and awareness for our Kickapoo Rail Trail, a 24.5 mile bike trail between Champaign/Urbana and Danville, with a stop at Kickapoo State Park. 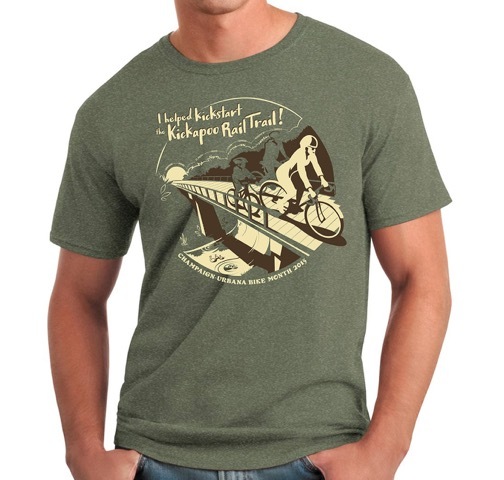 So we have a cool Kickapoo Rail Trail themed CU-Bike Month 2015 t-shirt all ready and our plan is that everyone who makes a donation to the Kickapoo Rail Trail will get one of these shirst with the cool tagline: "I helped kickstart the Kickapoo Rail Trail!" We want to encourage all of you to be involved and be generous, as giving to the trail is a huge investiment in the future of biking in our community. Champaign County Bikes will collect and give 100% of these donations to the Kickapoo Rail Trail fund that will be applied as local matching money for a large federal grant (20% local 80% fed). So your gift will be multiplied 4x, so it really makes a difference. Consturction will happen as funds come in, so we will begin to see work on the trail from Urbana to St. Joseph begin this fall! Donations are not required to particpate in Bike to Work Day or any of the other Bike Month events. But it takes a donation this year to get a t-shirt. Donations for these shirts can be made at any of the CU Bike Month Events all during the month of May, or by visiting the Champaign County Bikes website. $0 - Not now, thanks. If you made a contribution to the Kickapoo Rail Trail, then let us know your shirt size. You can pick up your shirt at the Market at the Square, May 9th, or at the Bike to Work Day Welcome Station you selected above. Champaign County Bikes (CCB) would like to offer you a free 6 month CCB membership so that you can receive CCB's occasional email newsletters with news about what's happening in the local bicycle community this summer and fall. Thanks, but I'll skip this opportunity now.